Hamilton County Department of Education Interim Superintendent, Kirk Kelly, speaks to reporters. Members of the Hamilton County Department of Education visited the Chattanooga Times Free Press to discuss goals for the 2016 school year. Kirk Kelly said he is the most qualified candidate to lead the Hamilton County Schools district, but he wants the school board to conduct a search before choosing him for the job. "I am interested in becoming the superintendent of Hamilton County, and in the interest of the community and all [who are] involved, I want to go through the search firm process," Kelly said during a news conference Monday afternoon. Hamilton County school board member Joe Wingate and Hamilton County commissioner Sabrena Smedley are holding a meeting Nov. 14 to discuss the selection of the district’s next superintendent with the community. 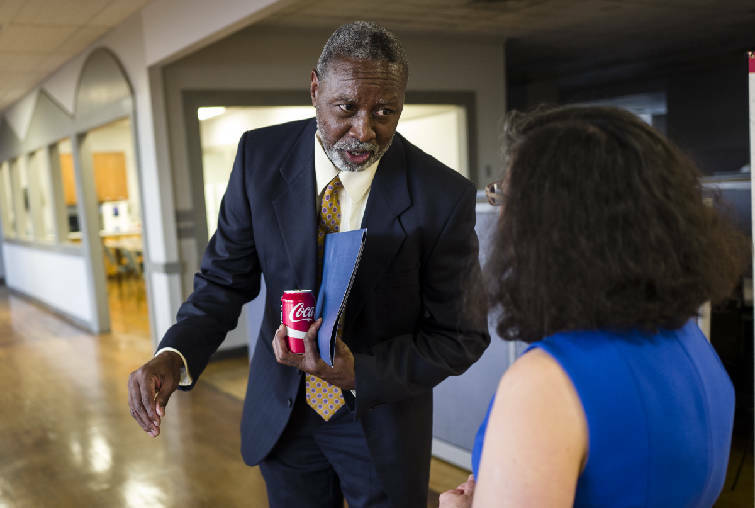 The meeting is scheduled to be held at East Hamilton Middle/High School at 6 p.m.
Interim Hamilton County Schools superintendent Kirk Kelly speaks with Bea Lurie before a forum hosted by the Times Free Press titled "Study Hall" held at the newspaper's offices to discuss education in Hamilton County on Tuesday, Oct. 18, 2016, in Chattanooga, Tenn. A panel of educators and education administrators answered questions about teacher quality, preparation, and solutions to education issues facing the district. 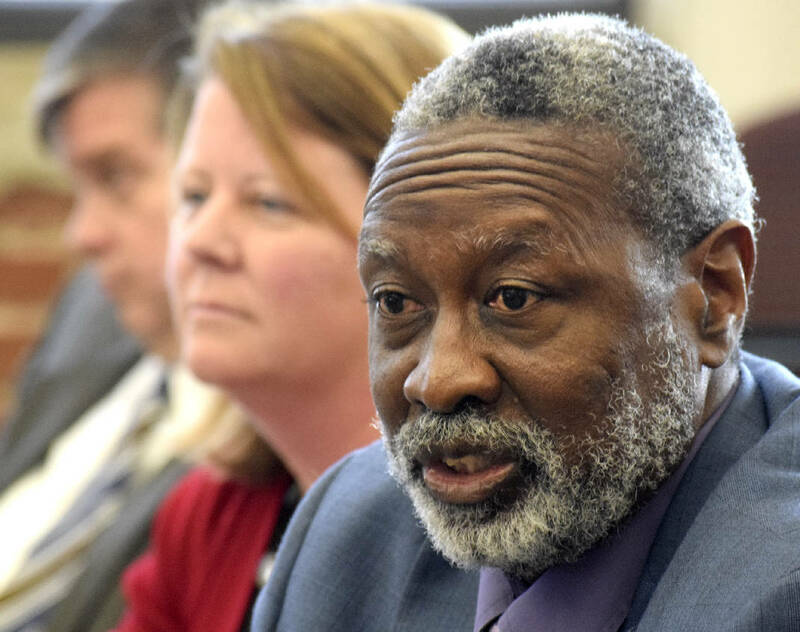 Kelly, who has served as the district's interim superintendent since April, asked the board of education not to vote to hire him next week as the district's permanent leader. Before Kelly's announcement, school board members said they were unaware of what he planned to say. But after the announcement, school board chairman Steve Highlander said he expects the board will honor Kelly's request. School board members Kathy Lennon, Joe Galloway and David Testerman voiced support for hiring Kelly during a meeting two weeks ago, but the board was unable to take a vote because the public had not been properly notified of the vote for 15 days, as board policy requires. The board instead voted unanimously during that meeting to hire the search firm Coleman Lew and Associates Inc. to help find the district's next leader. But last week Testerman and Galloway asked that a vote to hire Kelly be added to the Nov. 17 agenda session. Kelly said he is honored by the support of Lennon, Galloway and Testerman, but he wants to respect the wishes of all nine school board members and have his name put up against those of other candidates before being hired for the job to increase transparency. School board members Rhonda Thurman, Greg Martin, Joe Wingate and Tiffanie Robinson told the Times Free Press last week that they want to hold a search before deciding on a leader. Coleman Lew and Associates Inc. is the most expensive of the three firms interviewed — estimated to cost about $60,000 — but seemed to have the most aggressive national recruitment strategy. Board members who voted for the firm said it seems the most qualified to find a diverse group of candidates for the job. Highlander held a community meeting Monday night at Wallace A. Smith Elementary School, and a couple dozen people attended, sitting in metal folding chairs in the school's cafeteria. Several district administrators also were present — including Kelly. Highlander asked the group members what characteristics they want to see in the district's next leader. Rachel Turner, a teacher at Hamilton County High School, said she wants the superintendent to have a background in education. "As a teacher I don't see my students as numbers or test scores," she said. "I see them as individuals." Turner said she hopes the next leader will do the same. Highlander did not elaborate on what he would like to see in the next superintendent, but said earlier in the meeting that he wants someone "who understands education, yet can take care of a dollar." Ernest Reid, pastor of Second Missionary Baptist Church, said members of his congregation have been saying the district's next leader should be an educator. "I would hope that that would be a priority," he added. Highlander said he talked to Coleman Lew and Associates Inc. about the likelihood of finding a CEO of a large business interested in the job, and was told that based on the pay there would not likely be anyone with that background interested. Sterling Jetton, who ran for Hamilton County assessor of property this year, said he doesn't think the educators who've been leading the district over the years are doing an adequate job. "I think we need someone who can take hold of the reins and start driving the truck," he said, noting that the school district is the largest employer in Hamilton County. Dean Moorhouse, who ran for Highlander's school board seat in 2014 and is now the president of the Hamilton County Pachyderm Club, agreed with Jetton. "A majority of our school board is educators, most of the central office is educators and the last three superintendents were educators and look where we are," he said. Erlanger doesn't hire a physician to head its operations but a CEO, he argued. Wingate attended the meeting and said he is looking for a leader who will create an environment that makes teachers want to stay and teach, regardless of which school they are in. School board member Karitsa Mosley Jones said she wants a diverse pool of candidates, saying students in Hamilton County deserve the best. Jeanette Omarkhail, a teacher at East Lake Academy, said the culture in schools has been more positive lately and she is concerned someone without a background in education will drain teacher morale. Later in the night, Omarkhail observed that not many teachers were in the room, saying they were likely at home preparing to teach today. She asked if there was a way the board could gather feedback from teachers, whether online or by going to the schools. Highlander said that is something for the board to consider moving forward.